on how to grow asparagus!" Neessen is an enthusiastic, innovative propagator of strawberry and asparagus plants. All our asparagus plants are grown according to the ‘Select Plant’ system of Naktuinbouw, the Netherlands’ Inspection Service for Horticulture. We have a broad range of varieties of asparagus plants we raise ourselves. Besides raising asparagus plants we have been producing asparagus ourselves, too, for more than 50 years. We will of course gladly support you with advice on how to create new asparagus plots and select the most suitable asparagus variety to meet your requirements. 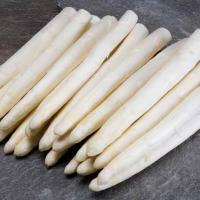 We have varieties that are suitable for producing white asparagus and varieties for producing green asparagus. At this website you will find more information on these varieties and how they can be used.